Did you know that the average person takes about 8,000-10,000 steps a day? The average person will walk over 100,000 miles in their lifetime, or more than four trips around the world! Did you also know that more than 75% of people will experience foot problems in their lifetime? That’s where custom orthotics come in! Orthotics are a biomechanical medical appliance used to align the foot and ankle in order to correct posture and imbalance. Much like glasses work for your eyes, custom orthotics are custom tailored shoe insoles that work to alleviate strain and stress from your body by aligning your feet. Custom orthotics fit comfortably into your shoes and have the advantage of being made from a direct imprint of your foot. Custom orthotics are an essential part of physical well-being and are covered by most extended healthcare benefit providers. A Gait Scan is an innovative tool used by our Chiropractors to scan your body’s gait cycle through a series of dynamic scans that measure your body’s biomechanics. It allows your healthcare provider to make an in-depth assessment in order to address and treat issues. Another highly effective way of measuring your feet for orthotics is to use a foam-core mold. 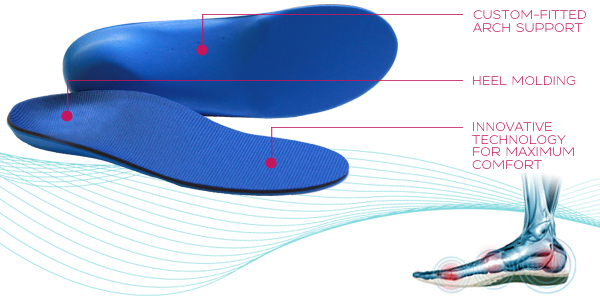 Pressing your foot directly into the foam core ensures that your feet are properly molded for the insoles. The simple answer to that question is everybody! Custom orthotics are used to treat a multitude of biomechanical issues. Do you suffer from back, shoulder, knee or foot pain? If so, custom orthotics are an effective way to correct your posture, re-align your step and restore your natural foot functions. At Simcoe Place Health Clinic, we carry two major brands of custom orthotics. Our chiropractors will fit you in for your orthotics in a convenient and informative, 15-minute fitting session.